For over three years, Taylor Strode has served as a member of the New Leaders, NYC Outward Bound School’s junior board that brings together a diverse group of young professionals who support the mission through volunteering and fundraising. 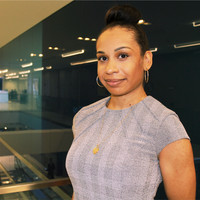 Professionally, Taylor works at Dow Jones as the Global Program Manager for Diversity & Inclusion, helping to redefine the company’s philosophies around inclusion and promote all forms of diversity in the office and culture. Taylor has a long history of volunteering in NYC: “I’m not from here,” she says, “I wanted to find new ways to meet people. But I also wanted to get more involved with the community and do something different,” to develop and promote the leadership of young women or students of color. When she first moved to NYC, she volunteered occasionally with New York Cares, but wanted more opportunities to work with students directly. When she saw on her company’s volunteer network that Brooklyn Collaborative, one of our Network Schools, was looking for a young professional to speak to their 11th-grade internship seminar students, she jumped on it! To her surprise, she was the only speaker that day, but she didn’t let that rattle her. She spoke frankly with the students about how it’s taken “heart, head, and guts” for her to reach her goals. She, in turn, was so inspired by the students’ curiosity and engagement, that she asked the teacher how she could get more involved, and it’s from him that she first learned about New Leaders. 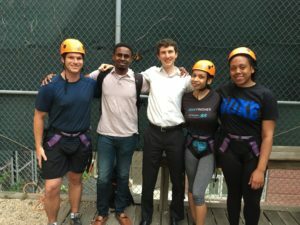 Taylor (second from right) with other New Leaders during a climbing event at our LIC headquarters. Hearing straight from staff and teachers about their devotion to their students’ success sealed the deal for Taylor. “The organization takes the time to push the students beyond what they see in New York City,” says Taylor, a lesson she wishes had been more present in her own middle and high school. Since joining, Taylor has rallied support from her friends and family to raise funds for NYC Outward Bound Schools and she’s also taken advantage of lots of opportunities to work directly with students. Last year, she devoted time off to helping students and their families work through the complicated FAFSA, a critical task for students seeking financial aid for college. “It really hit me [that day] many of the students were the first generation to try to go to college. A lot of these kids don’t have parents or have families who can help them [with these sorts of tasks]. But [the parents] are willing to go out with their children to get that help, to say, I want you to go to college, we’ll do what we need to do to get you through the door.” She was glad to be there to help those families achieve this important milestone. If you would like to know more about how to get involved with NYC Outward Bound Schools, or are interested in becoming a New Leader, please contact Engagement Officer Hannah Read.